Construction of Jacuzzi Tub in Brickwork & masonry. Laying of Mains Inlet to the Tub preferably 1 ½” Line. Lying of Operating Cabling as suggested by our Engg from tub to plant room. Lying of Under Water Lights sockets. Water Proofing of Tub before constructing the tub & after constructing the tub. Connection of Filter with Multi Port Valve. Connection of Control Panel & Mains Cable to the panel. The modern world is replete with lifestyle disorders, chronic stress and a general paucity of time. But have we ever stopped to question our state of silent acceptance and inertia Is this mindless race leading us somewhere Have we ever taken out real time for ourselves? If only we could hit the pause button! We now invite you to Steamers India Spa, a cocoon of compassion, warmth and peace. A place where we gently take you into our folds, pamper and detoxify you thoroughly; leaving you feeling renewed as a freshly sprouted leaf. A spa with a difference, we also heal your pains with special therapeutic treatments performed by highly trained physiotherapists. So, throw your worries to the wind. Get ready to pause, detox and refresh. 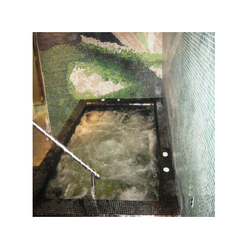 Packaging Details: Enjoy the warm water hydrotherapy massage and relax after exhausting day by installing Steamers India Jacuzzi Fittings on the Hot-tub. 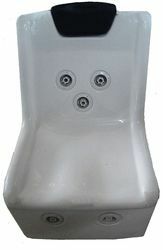 These nozzles, pump and piping can also be fitted on marble tubs or any other tub as per architect's design. We can also supply robust FRP tub and on-line fitters/heaters.